Bassist Brandi Disterheft follows up Juno-winning Debut with another debut: Second Side is first recording in new Justin Time deal. Adventurous work features standout production by Delirium's Rhys Fulber and guest vocalists Holly Cole and Ranee Lee Sept 15th sees the release of Second Side, Brandi Disterheft's label debut for Justin Time. The Juno Award-winning bassist and composer has delivered an adventurous, joyful work, full of surprises, that's also a heartfelt paean to love. Second Side is a refreshingly bold and beautiful work that successfully marries Brandi's taste for adventure, her unconventionality, and her desire to entertain both herself and her burgeoning fan base. From the album opener, "Sketches of Belief," with its film noir ambience, to the last track, featuring guest vocalist Ranee Lee ("This Time the Dream's On Me"), Second Side is a rewarding listen, revealing the many-layered work of producer Rhys Fulber. "Brandi is a unique artist," adds Fulber. "She's willing to both pay respect to her chosen genre and to take risks. She has a firm knowledge of jazz, yet is always looking forward." Canada has long been fertile ground for great musicians, not least in the jazz genre, yet Brandi's intriguing ideas seem to have struck a chord with audiences wanting more than conventional jazz, and more than the pretense associated with part of the indie scene. Second Side satisfies, with its atmospheres that alternate between genres. Second Side draws in the listener from its first strains. "Sketches of Belief," inspired by Miles Davis' "Sketches of Spain," is a lush soundscape, cinematic and expansive. Note the wonderful playing of trumpeter of William Sperandei and saxophonist Chris Gale, whose strong contributions also figure elsewhere. "Combien de Chances" is one of two tracks that feature Brandi on lead vocals, and this first one is in French. Despite its serious, somewhat political message, it's also sonically rich and highly entertaining, with its surf guitar (conjuring John Lennon's playing on Yoko's "Walking on Thin Ice"), its relentless rhythms, and its mariachi horns. "Second Dawn" features a dialogue between kalimba and double bass, which is then joined by Sly Juhas' drum patterns, almost industrial sounding. Incredibly, it all works, and it's the first of several brief instrumentals (along with "Second Dawn" and "A Night In Haiti") that are no less interesting than the vocal tracks, and that expertly wind throughout the album's recurring themes of love, loss, redemption and transcendence. "Twilight Curtain" showcases a standout vocal from Brandi and shimmering production from Fulber, who co-wrote the track. "My Only Friends Are the Pigeons" features the passionate saxophone of Chris Gale, in the tradition of such great, grooving horn players as David "Fathead" Newman and Johnny Griffin. "He's Walkin'" is a co-write with singer Holly Cole, and is one of the album's finest moments. The song chronicles the end of a relationship, with the protagonist emerging triumphant, wizened, but also nostalgic. Yet the song is also enjoyable as a joyous, raucous romp, and Cole's performance evokes early rockabilly queen Wanda Jackson at her best, circa "Fujiyama Mama." "Liege" is a lullaby, named for the city in Belgium, and features a lovely complicity between Brandi's bass and pianist Stacie McGregor, whose playing is excellent throughout the album. This charming composition evokes Satie, in its understated yet deceptive simplicity. "Let Her Shine" does just that - it's Brandi alone, solo bass (at first), and shows just why Oscar Peterson said "she is what we call serious." Big, bold and authoritative, this track puts to rest any doubts on whether Brandi can play her instrument. 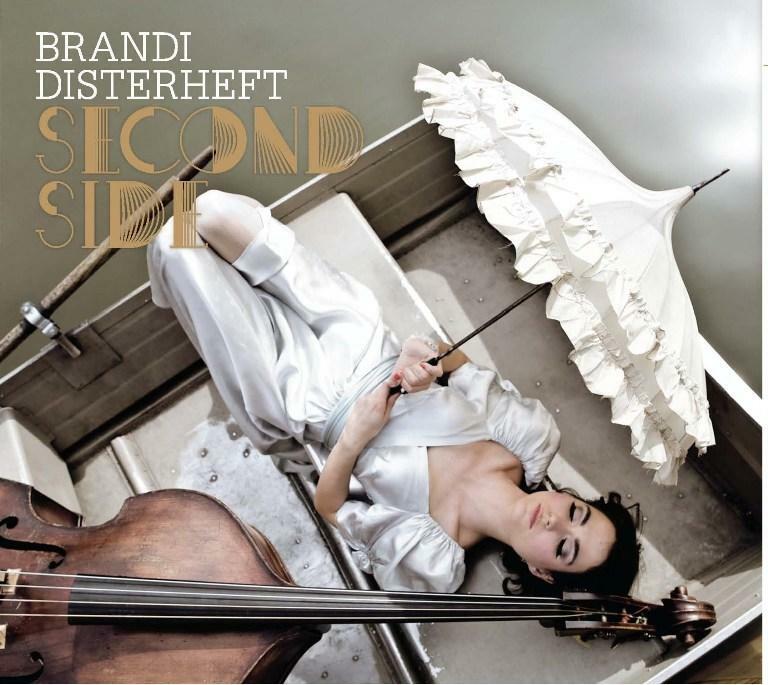 It's not surprising that this album of almost entirely original songs should end with a standard, as that's part of who Brandi Disterheft is, a player with great respect for the past, who nonetheless enjoys a healthy taste for adventure, with one foot firmly planted in the future. Adds Brandi, "I grew up listening to Ranee Lee, so I was happy she could be part of this. Her singing is great on this track!" The choice of song is a propos as well, as it closes a superb album that's also a meditation on love, in all its "states of belief." Not one to rest on her laurels, Brandi Disterheft has produced an impressive follow-up toa strong debut, yet it's clear that her restless creative spirit is only beginning to show its full potential. Second Side is a bold work that literally leaves one wondering what she'll think of next. We can hardly wait! .